Brrr...what a cold weekend we had, especially on Saturday with a high of 57. Fortunately, I had this knit sweater, the beanie and some shearling to keep me warm. This is what I wore to host a house warming party at my new place. You've probably seen some pics of the living room decor in this inspiring style post. The blue accent wall was a hit and so were the specially made Ciroc-Obama drinks. Want to know how to have a successful get together at your home? 4. Great conversations ♥ Nasty Gal shoreline knit ♥ Garden necklace c/o AliExpress ♥ F21 jeans ♥ Charlotte Russe shearling booties ♥ Crystal slim bangle c/o AliExpress Throwing or attending any house parties over the holidays? And can I just say, I am enjoying the fall and all, but can a girl get another 30 minutes of daylight to work with please? Gorgeous as usual Cheryl! Congo on the house warming! Saw a pic on instagram! :)I love the sweater, beautiful colours and looks amazing on you! I love those booties!! And that sweater looks great on you. Hi Cheryl, how are you? 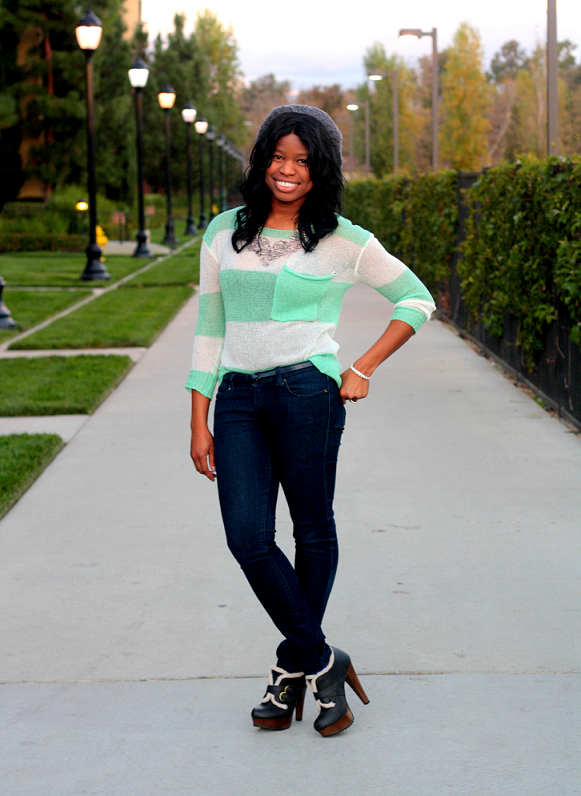 I like how you up styled the adorable sweater with those amazing boots! P.S I wanted to ask you about your surname, its quite a common one here in Safrica, any connections to the country perhaps? Love your top and your beanie! I love that sweater! It looks so warm and cozy but I also love that the colors are sort of light and summery. Ooooo....that blue drink looks might fine:) And loving the beanie and the sweater, Cheryl. PS Love fall too, but the lack of sunshine....bah! love your outfit and you look stunning as always! Love that sweater! I've been meaning to hit up F21 for a while now. I think it's about that time. you looked really cute Cheryl! i love that top! hahaha, i thought you would be at the movies too :) i'm a bond junkie so i loved it. you look awesome!!! goodness those heels re kickass lurv it. Thanks for your reply...awww that makes sense because many South Africans are of Dutch origin! Congrats on the new house dear. yeeaa your styling! love your sweater! Those ankle booties are so cute!! They remind me of Uggs (in a good way!). Love the mint stripes too. I haven't ever seen a sweater with that color of stripes! i'm with you on that extra 30 minutes!!! i love this look on you. i might need to have those booties in my life! the color of the knit is pretty, love that mint color! and those booties are cute with the fur! Happy housewarming! Glad it went well with the drinks, convo, and admiring your lovely home. We don't do a lot of formal housewarmings anymore, but my sister just moved, so hopefully she'll organize something...and then one of Alan's friends just moved and will be hosting a post-Christmas party. Loving that sweater and the color! Those boots are super cute and look cozy too! congrats on your housewarming party!! Loving the outfit Cheryl, too cute! Sounds like a fab party too. You look like a true doll! Your sweater looks great with your boots and beanie!